These classes provide pupils with an eclectic mix of creative and stimulating opportunities to explore artists and techniques in ways that are both personally relevant and developmental in nature. Pupils will build a wealth of creative skills, developing imaginative and intuitive ways of working whilst improving artistic knowledge and their understanding of media and materials. We will reference both contemporary and tradition art works and demonstrate how the visual elements can be used to convey a range of ideas, meanings and feelings. Pupils are encouraged to be versatile in their choice of materials and we will guide them with their application of media. 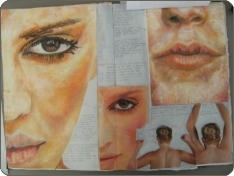 Over a typical 6 week course, pupils will produce 3 or 4 finished pieces. Contextual information is given at the beginning of the session so that pupils are able to further develop their understanding of the work, enabling them to create interesting and exciting art by referencing a highly diverse selection of artists. My aim is to inspire further development of work.